Baby massage has been practiced in many cultures for thousands of years, and research shows many benefits. This guide has been created to give youexamples of what you will learn in a massage class. Through baby massage, you can gain increased awareness of how your baby communicates and ideas on ways to support your baby in their first few months. You and your baby will discover what is best for you both. It is important to be mindful that baby massage is something you do with, rather than to your baby. Touch is a powerful way to communicate your love to your baby. In the first few weeks, use slow and positive strokes, not spending too much time on one area. Newborn babies may find their senses over-stimulated and most will seek solace in the arms of their parents for the first few weeks and some may just want a gentle stroke down their backs, over their clothes. 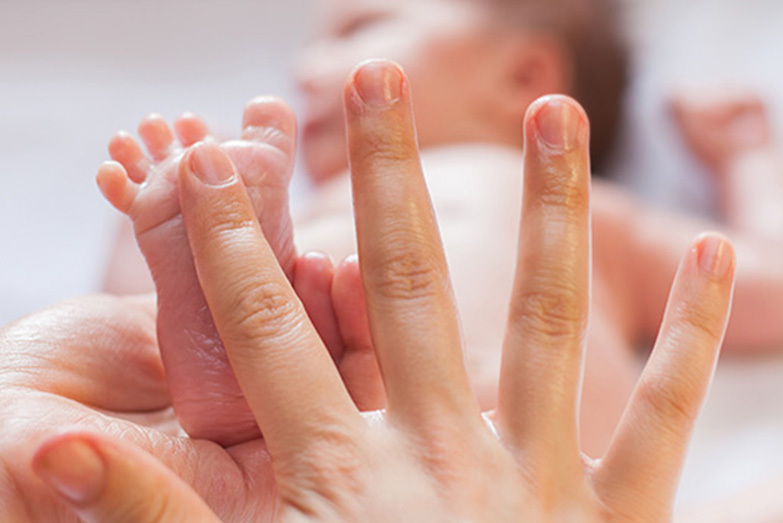 If your baby says ‘yes’ to massage, begin with a resting hand. This resting hand technique is used before massaging any body area. It can also be used when your baby needs a break during the massage. This is a good way for your baby to feel secure and enjoy touch. Check you have enough oil on your hands before you start. Begin on the legs with a newborn because it is an area which is usually accepted by babies. Downward strokes are more relaxing. Babies usually love having their feet massaged. Watch your baby’s reactions in case of sensitivity. A little foot massage can have a positive effect on the whole body. When baby’s umbilical cord is healed, gentle massage on the tummy can help with digestion and tummy troubles. Start by making contact with your baby’s tummy with a reassuring relaxed hand. If your baby is happy, make gentle paddling strokes, with one hand following the other. Holding the baby close to your chest, massage your baby’s back beginning at the neck, swooping down to their bottom. These baby massage strokes are based on INFANT MASSAGE: A Handbook for Loving Parents by Vimala McClure, the founder of the IAIM. Massaging baby is also endorsed by the Integrated Midwives Association of the Philippines, Inc. (IMAP). After the birth of their baby, many mothers and some fathers may suffer from some form of depression. ‘Baby Blues’ is common and can leave mom feeling elated one moment and very emotional the next. This usually disappears after a few days. Depression is a more serious and longer lasting condition and can show signs anytime from straight after the baby’s birth or later. Research into postnatal depression shows that baby massage can enhance parent and baby attachment, through encouraging eye contact, skin contact, voice and sensitive interaction. Contact the Integrated Midwives Association of the Philippines (IMAP) to see what options are available.